This traditional water driven flour mill used to be a source of livelihood for the people of Dhur village. It has been abandoned after the intake channel was washed away by flashflood. 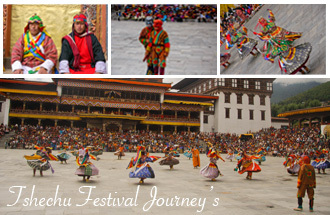 The programme has been rehabilitated as it symbolizes an authentic Bhutanese tradition. 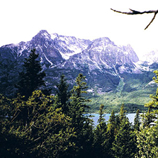 Continue the trek uphill through the blue pine forest and reach the camp at Schonath (3450m) in hemlock and juniper forest. 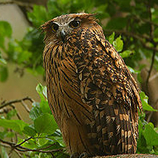 The hauling of owls through the night is quite common, hence the name the Owl Trek. Flight into Paro with Druk Air, Bhutan’s National Airline is spectacular. The flight takes you over the great Himalayas, offering most beautiful scenery of the world’s highest glacial peaks. As you enter Paro valley, you will see the Paro Dzong (Fortress) on the hillside overlooking the Paro Chhu(river), with Ta Dzong, formerly a watch tower and now the National Museum. -Through the Paro valley to take on a stunning hike on foot to visit the Taktshang Gompa or Tiger’s Nest viewpoint. Your hike to Taktshang from the road point will take through the well maintained path which is quite uphill and it takes around 3-4 hours at an average walking speed. The trail climbs through beautiful pine forest, many of the trees adorned with Spanish moss, and an occasional grove of fluttering prayer flags. -Evening if you wish your dinner at typical Bhutanese farm house to experience the Bhutanese living or we can halt a night in farm house or at hotel, Paro. -Visit to National Memorial Chorten, a stupa dedicated to world peace and prosperity in 1974 in memory of the Third King of Bhutan; the Kingdom’s rich culture at the National Library; the National Institude of Zorig Chusum where students undergo training course in Bhutan’s 13 traditional arts and crafts; Folk Heritage Museum which will provide an insight into traditional Bhutanese farm house and rural past through exhibits and documentation of rural life. - Visit Changangkha Lhakhang, a fortress likes temple which lies perched on a ridge above Thimphu; Taken Preserve to see the rare national animal of Bhutan. This animal is chosen as the national animal of Bhutan for its uniqueness and its association with the country’s religious history and mythology. 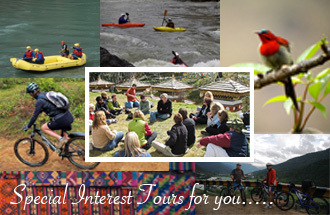 - Drive towards the BBS tower will provide a bird’s eye view of the capital; visit nunnery temple and followed by a visit to Tashichho Dzong or “the fortress of the glorious religion” which is Bhutan’s administration and religious centre and houses the throne room of His Majesty the King of Bhutan, other Government offices. It is also the summer residence of Je Khenpo or Chief Abbot. 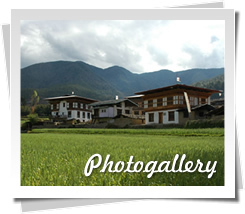 -Punakha through some of the Kingdom’s richest agricultural land and most dramatic river valleys. The first stop will allow us to hike up to Hongtsho Goemba to view the stunning 15th century wall paintings before heading over Dochu La, 3050meters pass, snow-capped eastern Himalayan ranges can be seen on a clear day. -The beauty is further enhanced by the Druk Wangyal Chorten 108 stupas built by the eldest Queen Mother and then winding our way down into the Punakha Valley. On the way you will stop at Mitsina village and visit Chimi Lhakhang the monastery of fertility. In the afternoon you will visit Punakha Dzong which stands majestically at the junction of the two rivers Pho Chu and Mo chu. -Heading out from the abode of Punakha you will drive about 6 hours to Trongsa passing over Pele La, 3390 meters pass. Trongsa forms the central hub of the kingdom and is historically the place from where attempts at the unifying the country were launched. -As you continue onwards you can view the incredible massive Trongsa Dzong, an architectural Wonder! Trongsa medieval watch tower and the great Mangde Chu enhance the Trongsa dzong in its exceptional beauty. -Visit Trongsa Dzong, the dzong was built in 1648; it was seat of power over central and eastern Bhutan. Both the first and second kings ruled the country from this ancient seat. Visit Ta Dzong preached above the Trongsa Dzong this is watchtower which once stood guard the Trongsa Dzong. This is now restored from ground up and it is the museum presenting the rich historical and religious heritage of Trongsa Dzong. -Exploration of the Bumthang Valley, this valleys are general name for the four valleys of Ura, Chumey, Tang and Chokhor and is considered to be one of the most beautiful and sacred valleys of Bhutan. -Your visit in Bumthang includes Jakar Dzong, the administrative center of the valley; Jambay Lhakhang, one of the oldest monasteries in the Bhutan, dating from the introduction of Buddhism in Bhutan; and Kujey Lhakhang, one of the most sacred places, where Guru Rinpoche left his body imprint on the cave when he was meditating. From there we will hike 30minutes to Tamshing Lhakhang lies on the other side of the river opposite the Kurje Lhakhang. It was built by Terton Pemalingpa the treasures discover, he was the ancestors of Royal Family; Kenchosum Lhakhang; and Mebar Tsho (Lake of Burning Fire), and this is a sacred lake for the Bhutanese who believe that Pema Lingpa discovered religious treasures from the lake. -Trek Start at Manchugang and visit the biggest village in Bumthang, called Dhur at an elevation of 2900 meters above sea level. The village consists of about 75 households with a recorded population of around 800 people. The single village has three types of inhabitants the Kheps (tax payers) having cattle and farmland, Brokpas (nomads) having Yaks and a third group having either. This village has two different dialects, the usual Bumthang Kha and the Brokke (nomadic dialects). A walk above the village to get the overall view of the village is interesting. Climb down to the river where the traditional water-driven flour mill can be visited. -Trekking through the virgin forest of huge temperate trees like spruce, hemlock, fir, birch and many species of rhododendron makes you breathe the real wilderness of Bhutan. Bamboos are the main undergrowth of this wild forest. During the months of April and May the rhododendrons are in full bloom. In about two hours, you will arrive at the Drangela Pass (3600m). 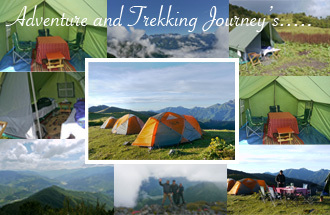 Ascending the Kitiphu ridge brings you to an altitude of 3870m for the night camp. If weather favors you, have a wonderful view of the valley and the panoramic snow caped Himalayan Mountains. The highest mountain of Bhutan Gangkarpunsum (7541m) stands right in front of you when you are on the peak of Kitiphu (4000m). 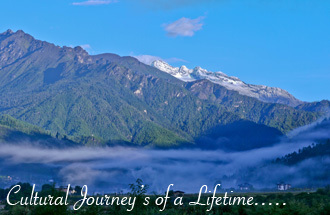 -The magnificent sun rise in the morning is a new experience in Bhutan. Climb down to the monasteries of Zambhalha, Chuedak and Tharpaling which brings you to the religious life of monkhood, the historical Buddhist learning centre. Chuedak monastery has 100 Avoloketeshvaras in the form of Chukchizhey (eleven heads) that you will see nowhere else in the country. Afternoon, walk along the ridge of Kikila and finally follow the traditional trek route between Trongsa and Bumthang (the Royal Heritage Trail). The best view of Jakar Dzong will end your three day trek with many interesting and unforgettable memories. -Phobjikha the valley is one of the most important wildlife preserves in the country, because of the large flock of black-necked cranes in winter. The valley also has a very interesting Nyingmapa monastery dates back to the 17th century. -visit to Crane Observation and information center. Then we will drive to Paro on way we stop at Wangdue to visit Wangdue Dzong and hike to Rinchen Gang clustered village, houses are made from mud and stones. The people of the village are said to be Indian origin. 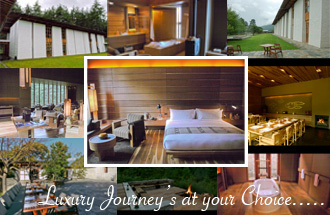 -enjoy the view of Himalayan ranges and snow peaks. You will also visit Druk Wanggyal Lhakhang built by the eldest Queen mother; the past and future appear to merge in the details of the Lhakhang that tells the story of a supreme warrior figure whose vision pierces the distant future.